Everyone loves meerkats – the cute mongoose, kitten and teddy bear-esque creatures who adorably stand on their hind legs and swivel their heads curiously. Relying heavily on their inherent cuteness, James Honeyborne’s film is ostensibly a documentary about a family of meerkats living in the Kalahari desert in Africa. Instead of relying on a traditional on-screen narrator, this brisk 80 minute film is shot and edited like a Hollywood-narrative production, with point-of-view shots and exciting action – it’s more Richard Donner than David Attenborough. 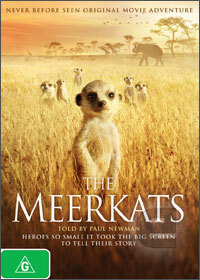 Our hero is Kolo, a young meerkat who has many lessons to learn about survival in the harsh desert environment. Taking lessons in scouting and hunting from his older brother, they encounter predator and prey, big and small, from lions, zebras and deadly eagles to snakes, scorpions and giant millipedes. By observing the animals over a six-month period, director Honeyborne has managed to edit together a narrative, glued together by the voice-over narration of Paul Newman. Though some of the suspense scenes involving multiple attacks simultaneously seem to have been created in the editing room (and a disclaimer in the credits admits as much), it’s remarkable how cohesive it is given the lack of communication between the director and his cast. It’s beautifully shot and some of the footage – especially that underground – is a wonder but it doesn’t stand out in comparison to what can be seen in many BBC documentaries. The visuals are nicely accompanied by the score by Sarah Class which is a pleasant and inoffensive mix of pseudo-African rhythms and traditional strings. The DVD offers the choice between Dolby Digital 5.1 and Dolby 2.0 but no special features. Ultimately The Meerkats is a little too cute for its own good, too intent on turning everything into a little storytelling drama. Sometimes it feels more like The Adventures of Milo & Otis rather than Life of Mammals, only minus the drowning of two dozen little cats.